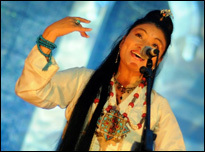 Since fleeing Tibet on foot in 1989, Yungchen Lhamo has emerged as the leading Tibetan vocalist on the world stage. From the quays of Sydney, Australia to the spotlight of Carnegie Hall, her a cappella performances have enchanted audiences in more than 70 countries since she began touring professionally in 1994. Yungchen’s name was given to her by a Tibetan lama when she was a baby and translates to “Goddess of Melody and Song.” Since the release of her award-winning first album Tibetan Prayer, her music has met with critical praise worldwide, alternately described as “beautifully evocative,” “mesmerizing,” “spine-tingling,” and “transcendent.” Her songs take listeners on an emotive journey across plateaus and soaring over vistas, with a charge and a charisma no doubt informed by her remarkable life story. Yungchen has received the blessing of the Dalai Lama and has truly become the voice of Tibet. Yungchen also initiated the Yungchen Lhamo Foundation to help Tibetan refugees and Tibetans in the occupied territories of Tibet. They call their music earth music, comprised of a combination of Tibetan and Yupi’k sounds. Culture Brothers delight the audience with their sophisticated talent. They promote all cultures present on earth today. Ngawang Sangdrol is a prominent former political prisoner from Tibet. She was imprisoned by the Chinese government in Lhasa at the age of thirteen for nine months and then again at the age of fifteen for joining peaceful demonstrations and shouting, “Free Tibet!” She used to be a Tibetan nun. While in Drapchi Prison, she recorded, together with the other thirteen "Drapchi singing nuns," freedom songs and poems as a peaceful form of protest. This was one of the reasons why her initial sentence of three years was increased to 23 years. 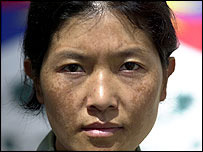 Ngawang Sangdrol was the longest sentenced female political prisoner in Tibet. In 2002, at the age of 26, she was released due to international pressure. Today Ngawang Sangdrol is committed to campaigning for Tibetan freedom. Award-winning and internationally acclaimed Inuit band from Alaska, Pamyua blends traditional Yup‘ik and Inuit music with funk, soul, reggae, jazz into their own unique style. It is an honor to have their support for Free Tibet.